We charge a fee of $199 to set up your account. After that we charge for the credit repair after you see results. 30 days later is when you will pay. We have 2 payment options. First, six monthly payments of $199. Or Second, 12 monthly payments of $149. At this point I know what you are thinking. People have said it to me before. You are thinking – wow that’s a lot of money – I saw lots of other websites that are cheaper. You know what – they are cheaper for a reason. If you are serious about getting results and getting them fast – then you have found the right website. I ask you to do one thing – call me and ask me to defend my fee to you. I will explain to you why I need to charge you more – my expenses per client are higher than my competitors because I do things they DO NOT do and I will explain what I do that they DO NOT do. Credit is like your health – If you needed a heart transplant – wouldn’t you want to get the best surgeon? If you had cancer – wouldn’t you travel a little father to go to the cancer hospital instead of the “regular” hospital? It’s like that with credit repair – there are lots of companies out there ready to take your money. Some just plain offer more services than others – period. We are not trying to be the largest credit repair company out their – we are simply striving to be the best. There are many people out there who cannot afford my level of service. If you want to hire a “dispute mill” then call me and I will give you the names of some of my friends who charge much less than I do. Every year I attend conventions on credit repair and conventions for collection agencies. It amazes me that my competitors are still cutting corners to save money when they could be getting a lot better results for their clients if they just spent some more money – but they won’t do it because their clients are not paying them enough money for them to spend more. I charge more – AND I get better results – and you know what happens? My clients are happy and I get more referrals! Here’s the bottom line. My competitor is going to tell you –> “he isn’t doing anything we are not doing”. You know what – they are wrong. Please call me and ask me about my service. This is my last paragraph – I need to make it count. If you are looking for help fixing your credit it is no different than looking for a doctor or a lawyer. What you need to do is to interview them. Please give us an interview for the job of improving your credit rating! 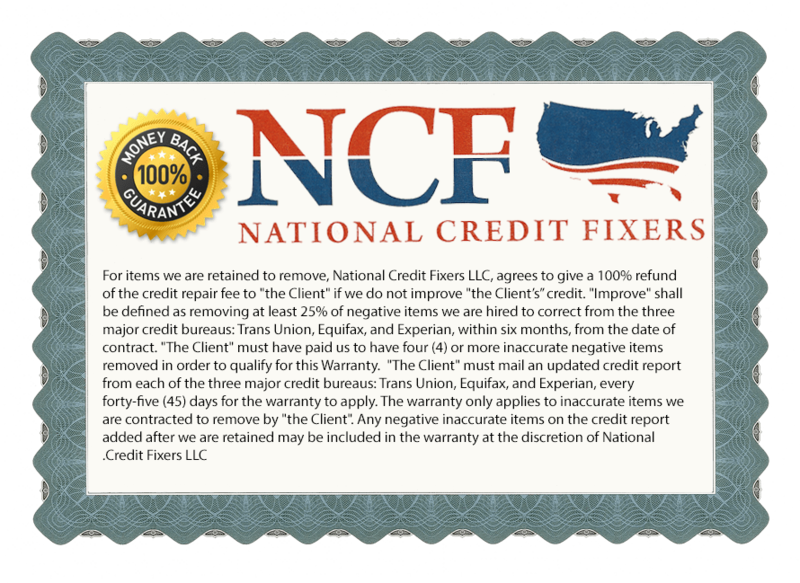 Call us at 888-NCFIXER (888-623-4937) or at 860-282-6181. Ask us to explain why we are worth more than those “other” guys.